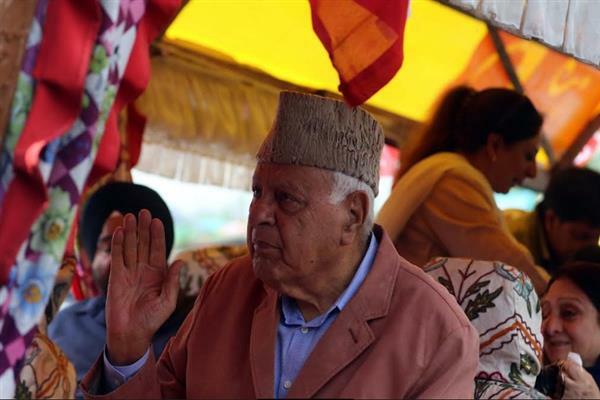 Srinagar: National Conference (NC) patron and party candidate for Srinagar parliamentary polls, Farooq Abdullah on Thursday said that New Delhi should remember that people of Jammu and Kashmir are not their slaves. “If they want us to do so then they should be ready for the situation that will emerge here, which can’t be controlled,” Abdullah said. He alleged that state Governor SP Malik was a RSS-BJP man who has asked people not to visit Kashmir and don’t go for Amarnath Yatra. “He is not the Governor of JK people but a BJP’s man. He even doesn’t know the order that is being issued by New Delhi. He doesn’t even know that highway was banned as the decision was taken by New Delhi and Union Home Minister Rajnath Singh’s statement and Ministry of Home Affairs’ statements have proved it that who has taken the decision,” Abdullah said after addressing a election gathering in the interiors of Dal lake. Talking to media persons after addressing a gathering at Dal Lake, Abdullah who was accompanied by many party leaders including NC’s provincial president Nasir Aslam Wani said that this election is different from other as it is not about only Jammu and Kashmir but about the country. He said that the electorates across India have to decide whether the country will be secular India or Hindu India. He said that people are coming out to vote to save the Muslims, Sikhs, Budhhists and people belonging to other communities. People have come to know that if they won’t cast their ballots then they can’t change the situation, Abdullah added.